You’d think a company that originated out of Duluth and even bears the city’s name in its name would have a retail presence here. Well… guess again. Duluth Trading Company is that company, for the moment, that was started in Duluth in 1989 and still has yet to have a physical retail store within the city. If you’re not familiar with the company, we don’t blame you. The have a curtailed clientele we’d say. They largely go under the radar because business actually is going so well for them that they truthfully don’t need much advertising. So what exactly are they? As mentioned before, the company started in 1989 in Duluth…. 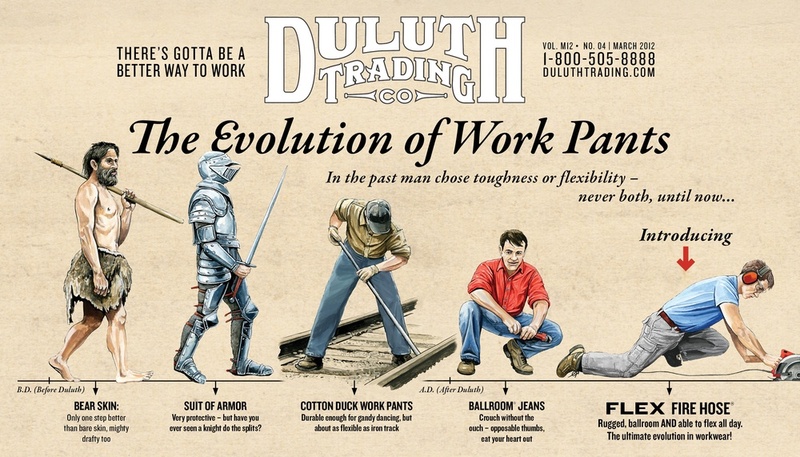 and well… instead of us explaining the story to you, Duluth Trading Co. has actually created a rather savvy and unique graphic to explain their history. We put it below for your own enjoyment. After all, who doesn’t like learning from pictures? For those who enjoy a condensed down version of their history in words… we’ve got you covered. In 1989 two Duluthians who happened to be brothers created “The Bucket Boss”, a durable canvas tool organizer that could fit on a drywall bucket… making the lives for construction not only easier, but cleaner. The kept designing products and soon came out with a catalogue called “Portable Products.” The catalogue consisted of eight pages and was purely built for expanding the traditional ways of tool organization. What we personally love about Duluth Trading Co. are the qwirky, and well done we might add, images that cover each advertisement and catalogue. They truthfully define the image of Duluth Trading Co. The man who does them goes by the name of Rick and is a close friend of the two brothers and still is the creative sole behind their marketing today. What’s unique about the origins of this company is that their first official headquarters was actually a refurbished barge on the waterfront of Lake Superior. Now that’s what we call creative. In 1993 the brothers decided to expand their product line, resulting in their company being renamed “Duluth Trading.” Every single product produced by the company was designed and tested by tradesmen. 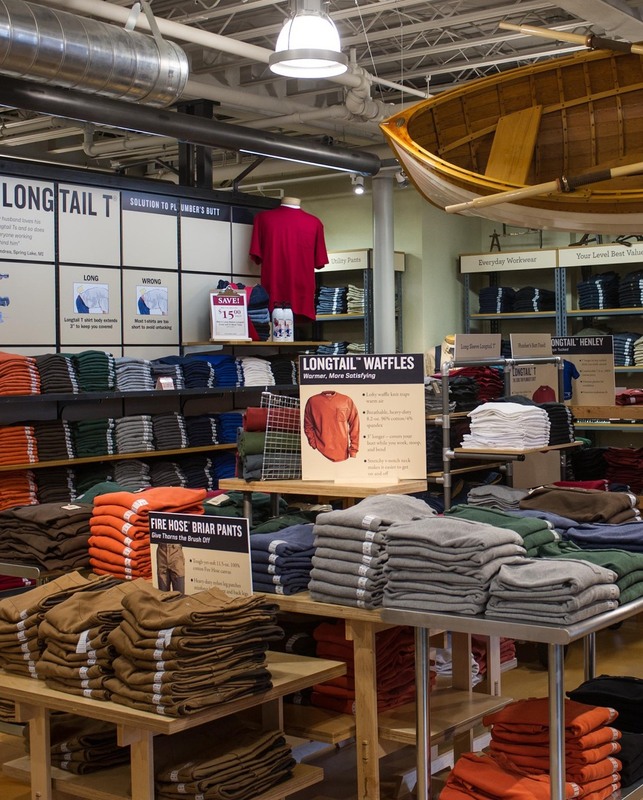 The company changed hands and the next product to rise to success, a product that put Duluth Trading Co. on the map, was the creation of the Longtail T Shirt. That’s right, the t-shirt with an extra three inches of fabric to cover up the plumbers… well… ya know. It solved the dilemma that seemed to plague plumbers for decades. Today their headquarters are found in Bellevue, Wisconsin where they have a 140,000 square foot warehouse and a state of the art call center. The company even introduced women’s clothing in 2005 for those women who desired workwear that could meet their standards of work. No more flimsy wear. And yes, the women’s wear is tested by real woman too and even accounts for 20 percent of the business! In fact the first women who ever saw the women’s line of products were those women who lived in Duluth. They were the first to receive the catalogue with women’s wear! Today the company has four retail locations. There is a flagship store in Mount Horeb, Wisconsin, along with a historic waterfront location in Port Washington, Wisconsin, and there’s even an outlet store in Belleville, Wisconsin. But hey! Where are the Minnesota stores? After all, didn’t this company start in Minnesota? 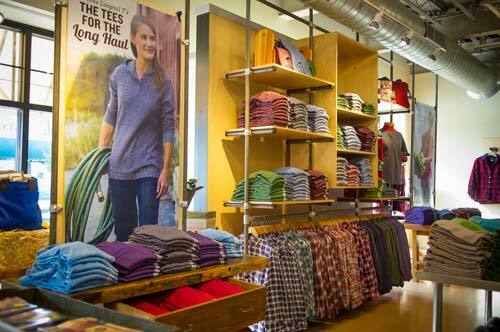 Just last year Duluth Trading Co. celebrated the opening of it’s first Minnesota location in Bloomington, MN. And no, it’s not in the Mall of America, rather it’s a few miles away at the bustling corner of 98th and Lyndale Avenue. And boy is this store big, to be honest, this technically is the new flagship location as it boasts over 14,000 square feet of retail space (Mall of America size mentality rubbing off??). That’s a whole lot of space devoted to crafty products. That still left the question though as to when in the world this company would make it’s way back home. The answer is this spring. Duluth Trading Co. has officially announced that after almost 25 years in business they will finally call Duluth home. A lease has been signed for a historic location in downtown Duluth in the bustling and thriving theater and arts district on Eastern Superior Street. We couldn’t have picked a better location for them. They particularly liked the Woodrush Building due to it’s historic characteristics. Tall ceilings, tall windows, and a brick facade, all on a bustling corner and in close proximity to Duluth’s tourist destination; Canal Park. Where could there be a better location? Apparently Duluth Trading Co. had been in search for a site to call home within Duluth for the last six months, but had actually had plans for a Duluth store for quite some time now. The space they will call home is a 7,000 square foot shop, similar in size to all their Wisconsin locations, in the 99 year old Woodrush building in the 300 block of East Superior Street. Executives felt that Duluth was finally the right move after the sheer success seen at it’s Bloomington, MN location. That location in fact is doing so well that they are looking to add another Twin Cities location soon. Here’s why this company is great news for Duluth. First off, it’s always great to have a Duluth company make a firm commitment by literally stamping their footprint of approval on the city with a retail presence. It further establishes their belief in the city and makes the city unique in it’s retail offerings to both tourists and residents alike. We pride ourselves on locality and what makes Duluth unique; the people who live, work, and call this place home. Another great thing about Duluth Trading Co.’s store is that they will be filling a vacant space that really has never been used to it’s full potential. From the day the building was renovated in the late 2000′s, we always imagined some type of retail or restaurant filling the space. For a while the was a rumor that Hooter’s even was interested in the location, but sadly we never saw anything retail or restaurant related enter the space. It was home to various tenants such as Charter Communications, an Obama Office during the elections, the company 50 Below, and others; yet, the building was craving a retail tenant. Sitting directly across from the Sheraton, kiddie corner to the Greysolon Plaza and a mere block down the road from the bustling restaurants of Zeitgeist Arts Cafe and Tycoons Ale House, the space was always destined for more. Finally the space will have the tenant it deserves. What is the best news out of this whole deal is the fact that this will solidify the future of this area, not that it hadn’t already been. Having a high profile destination retailer in the area like Duluth Trading Co, there will only be an increase in demand for retail space by other corporations in the area. This new retail store could in fact spurn a surge of retail development in the area of retailers who are hoping to feed off the traffic and success of Duluth Trading Co.’s retail store. So here ends our lengthy article on the official announcement that Duluth Trading Co. will be calling Duluth home this coming Spring. We hope we’ve answered all your questions and ultimately hope that we have created a sense of excitement within you. Spread the word. Build momentum. And let’s usher in Duluth Trading Co. with wide open Duluthian arms!